His dizzying success on this machine led Hercules Team Director Alfred Winkler to offer Witthoeft a factory ride by mid-season. The end of his first full year as a factory rider found Witthoeft in second place behind Zuendapp factory star Lorenz Specht. A year later, Witthoeft won his very first ISDT Gold Medal at the Isle of Man. By 1967, he was racking up notable victories. These included the German 100cc Enduro Championship, the OMK Trials Medal, and his second ISDT Gold medal at Zakopane, Poland as a member of the West German Trophy Team. Unexpectedly and quite suddenly, at the end of 1967 Hercules pulled all support from its factory enduro team, despite all that Witthoefts had achieved. Witthoeft remembers that he immediately asked the Austrian Puch company if they wanted him ride for Puch, then he hopped into his car and drove to Graz to pick up one of the newly developed 125cc machines. However, upon arrival he learned there was no motorcycle for him because the factory enduro bikes were not yet finished. Rather, they gave him a Puch that had been used for display purposes. Still, out of the gate Witthoeft (pictured above on the Puch) was unstoppable on the new bike. 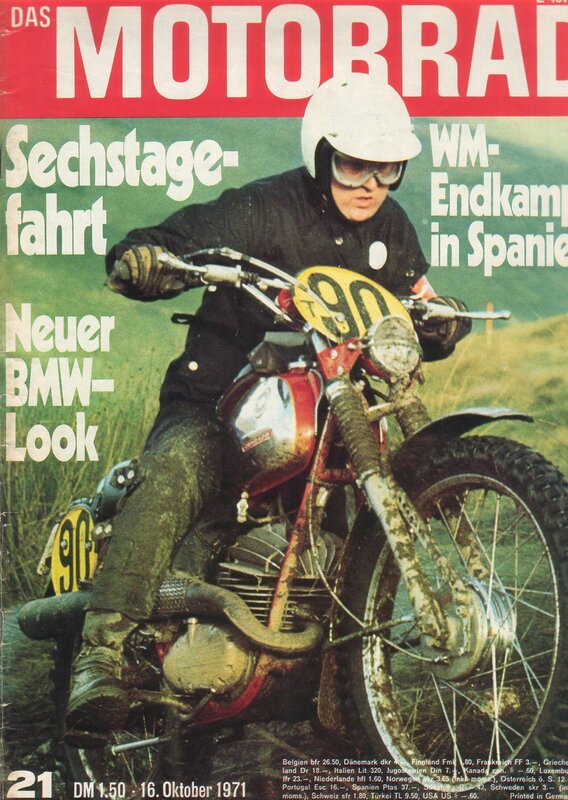 In addition to winning the German National Enduro Championship titles in 1968 and 1969, Witthoeft also won the newly-created European Enduro Championship titles both years. At the Garmisch-Partenkirchen ISDT, he was a member of the victorious German Silver Vase Team, garnering yet another Gold Medal. Few were surprised when Zundapp showed interest in the fast guy from Schleswig Holstein and offered him a factory contract in 1970. From 1970 through 1976, Witthoeft and his Zundapp remained a nearly unbeatable combination. He earned five German National Enduro Championships, five European Enduro Championships, six ISDT Gold medals, and became the overall winner of the 1973 U.S. ISDT in Dalton Massachusetts (Pictured above at the ISDT in Czechoslovakia, 1972). He was also a member of the German Trophy Team in 1975 and 1976, the last year that a West German team won the Trophy. He is also legendary for other racing achievements. For example, at the Fisherman’s Harbor road race in Bremerhaven, Witthoeft took his factory Zundapp motocrosser and installed street tires. Racing on the cobblestones of the old city harbor streets (Pictured below), the other riders on Maico, Yamaha, and Morbidelli were left clueless as to how to compete against Witthoeft as he went wide open, crossed-up, and drifting through the corners, riding enduro style on the streets. It was as if he single-handedly invented Supermotard that day. At the end of the 1976 racing season, Witthoeft announced his retirement. His rapidly growing motorcycle business (he owns a Kawasaki dealership still today) left him little time for competition. However, after 15 years of competing nearly every weekend, retirement proved an uneasy fate. When, in 1978, a “750cc and greater” class was created, the Kawasaki dealer heard his named whispered on the wind, and he got to work. Witthoeft took a twin-cylinder KZ750 and built an awesome enduro machine (pictured above) on which he promptly won the championship against the BMW armada in the aptly named “Bull Rider Class.” BMW was not about to take this defeat lightly, so they promptly hired Witthoeft away from himself, making him a factory BMW rider (pictured below). Witthoeft considers winning the 1980 European Championship title and winning the Vase at the 1980 ISDT inBrioude, France to be the crowning achievements of his career. In the 1980s, BMW began to refocus its attention away from national enduro championship and toward the Paris-Dakar Rally. Sensing the shift, Witthoeft got back to work in his workshop and created another twin cylinder enduro racer. This time a 510cc using a KLX250 chassis and an enlarged KZ440 engine became the special machine (Pictured below) on which he campaigned the European Enduro circuit. By this time—approaching the age of 40—he said he was riding “just for fun,” but this did not stop him from always being extraordinarily successful. And it was on this very machine that in 2000 he re-emerged after many years of retirement to compete in a Classic Enduro in Germany, making it clear to all present that for him winning an enduro was just like riding a bicycle. You just don’t forget how, nor had he forgotten how to climb the steps of the winner’s podium to collect his trophy. In 2007, Rolf Witthoeft announced his retirement from the vintage competition at the end of the year, stating that the Schimmeldewog Enduro would be his last ride. “I’ve been lucky to have avoided serious injury, and don’t want to press my luck,” stated the nine-time German, eight-time European, and two-time (each) ISDT Trophy and Vase winner. Photo of Rolf Witthoeft’s “last podium,” Herb Schek on the right. “Although I’m pretty sure you’ll see me at one or another enduro, or maybe on the trail, sometime,” added the Champ in parting. Indeed, in 2008 did not see Witthoeft riding vintage competitions, but when Motohistory called him some weeks ago he told us that he wants to visit one or two events this year. He laughs, “No, I will not take a bike with me. I will come as a spectator.” Of course, we will be at all surprised if he changes his mind at the last minute, bring a bike to ride—just for fun, of course! Rolf left me with great memories at the ISDT in Spain. He rode his little bike in the same Speed Test as most of the larger capacity bikes, and beat them hollow. He had a complete mastery of the intricate turns of the circuit. A truly giany-killing performance!